The 9th Annual Hoops From The Heart event has come to a close and what a night it was! Over 150 inner city kids attended and were treated to a sumptuous meal generously provided by Clay Oven and Pratt’s Foods, an official Hoops T shirt and a basketball autographed by some of the best basketball players in Manitoba. The fans were also treated to one of our most exciting games, a 104 to 103 overtime victory by the Manitoba All Star team over the combined U of M / U of W team. The exciting climax of the game came with the University team calling timeout with seconds to go and a decision to make on whether to go for a tie or the win. A few excited inner city kids decided to provide their own advice and ran into the team huddle with the players and coaches to yell “Go for it! !” This year’s crowd was the most engaged and animated we have seen yet with lots of cheering and hollering approval for every dunk and three pointer. We had 150 inner city kids leaving last night with big smiles, bouncing balls and autographed T shirts galore. The below photos say everything. A big thank you to the Hoops Organizing Committee for their effort, time and energy – Trevor Ahluwalia, Susan Hirst, Greg Mackling, Tom Nicholson, Gail Pierce, Angeline Rivard and Randy Viray. Another big thank you to our sponsors without whom this event would not have been possible: Thank you Minister Rochelle Squires and the Government of Manitoba for their support, Pratt’s Foods, Clay Oven, RBC and their volunteers, Ray Simard and Boulevard Consultants Inc., Investors Group, Lehigh Hanson – Inland Group, InstaFrame, Ogo Okwumabua and Home Run Sports, Basketball Manitoba, the Manitoba Association of Basketball Officials, Larry Vickar Chevrolet, Bailey’s Restaurant, Chum Optical, the Philippine Basketball Association, the Marigold Restaurant and, of course, the Universities of Manitoba and Winnipeg. A special thank you to all the players who came out to put on an excellent show, to CJOB’s Christian Aumell for stepping in as this year’s play-by-play announcer at the game, and to Rob Blaich who not only did the brilliant photography work shown here but also created (for the 9th time) the design for this year’s T shirt. 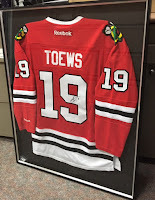 Winner of the framed Jonathan Toews Chicago Black Hawks jersey was Delfin Rodriguez. Events like this focused on supported underprivileged youth are important not only for these youth and their families but for the health and welfare of society as a whole. We are proud to play our small part in the goal of helping inner city youth and look forward to another exciting event next year to mark a decade of Hoops From The Heart! 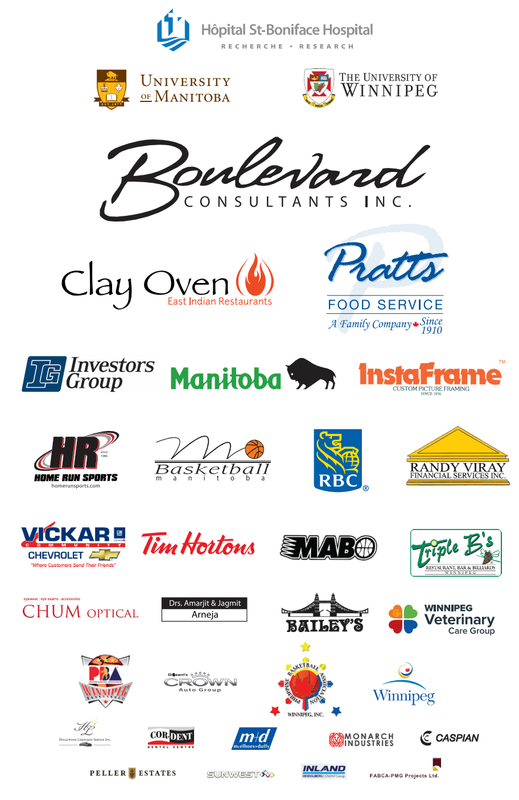 UPDATED: We are ready and set for the 9th Annual Hoops From The Heart Basketball Event in support of inner city kids! We have an exciting game ready to go featuring the best basketball players this province has to offer! We have players from the current U of M and U of W teams testing their skills again against a Manitoba All Star team (including European pro star Jarred Ogungbemi-Jackson!) that has beaten them the last two years! Can they do it again? 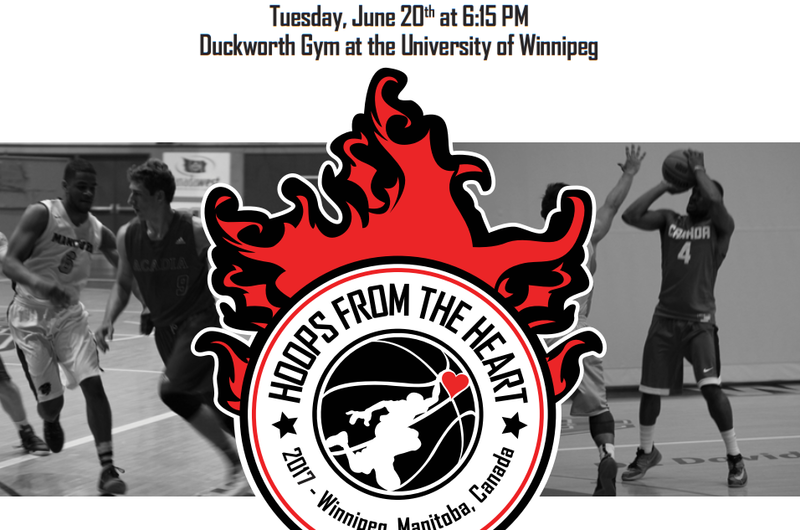 Come on out on this coming Tuesday June 20th at 6:15 pm at the Duckworth Centre gym at the University of Winnipeg to enjoy the best basketball in the province. Entrance is only $5 for adults and free for kids. All proceeds support inner city kids. 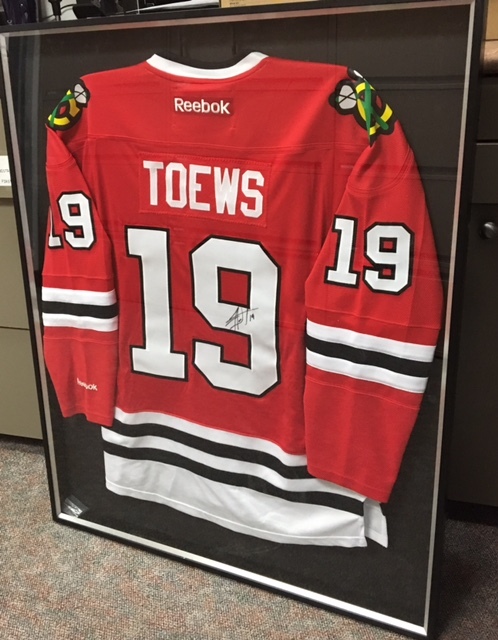 And win a framed Jonathan Toews autographed Chicago Black Hawks jersey at the game! It’s a win – win – win all the way around! 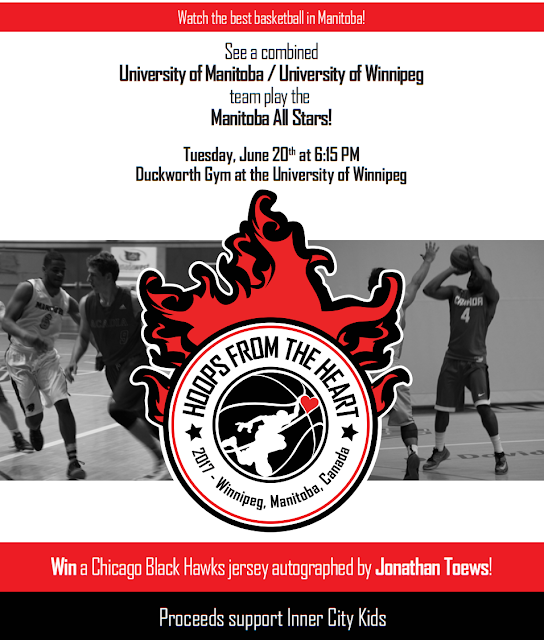 Hoops From The Heart is an annual event (now into its 9th year) where the best men’s basketball players in Manitoba play an exhibition game at the University of Winnipeg's Duckworth Centre. In the process, over 150 inner city kids are there to watch the game, receive a free meal, get their own Hoops From The Heart t-shirt, and take a basketball home, signed by one of the players! The proceeds of the event have also helped to create a Scholarship specifically for an inner city youth to go to either the University of Manitoba or the University of Winnipeg to play basketball for them. Watch great basketball and help inner city kids! Part of the proceeds also helps heart research at St. Boniface Hospital. Help fight heart disease, the #1 cause of death in Manitoba today, and show your support for the present and future basketball stars of Manitoba! Come on out to the University of Winnipeg’s Duckworth Centre Wednesday, June 20, 2017. It’s all for a great cause!